"... is part of a wave of companies getting into the music business to promote their own products, essentially becoming record labels themselves. 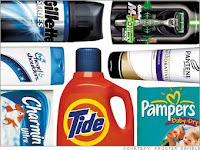 Procter & Gamble ... is joining Island Def Jam in a joint venture called Tag Records, a label that will sign and release albums by new hip-hop acts. It is named after a brand of body spray that P.& G. acquired when it bought Gillette. ... At a time when online file-sharing is rampant, record stores are closing and consumers are buying singles instead of albums, getting into the music business might seem like running into a burning building. But as record labels struggle to adjust to a harsh new digital reality, other companies are stepping up their involvement in music, going far beyond standard endorsement contracts and the use of songs in commercials. These companies — like Procter & Gamble, Red Bull and Nike — are stepping outside of their core businesses to promote, finance and even distribute music themselves. A few months ago, Bacardi announced that it would help the English electronic music duo Groove Armada pay for and promote its next release. Caress, the body-care line owned by Unilever, commissioned the Pussycat Dolls singer Nicole Scherzinger to record a version of Duran Duran’s “Rio” that it gave away on its Web site to promote its “Brazilian body wash” product. The energy drink company Red Bull is starting a label that is expected to release music before the end of the year. And at least some of this music is credible: a hip-hop song that Nike released by Kanye West, Nas, Rakim and KRS-One was nominated for a Grammy Award for best rap performance by a duo or group. The article develops the theme, demonstrating a surprising twist in the tale of the search for viable business models for promoting and recording new musical works in the post-traditional copyright era. One might consider that this marks a return to patronage, but with the brand-rich IP portfolio owner replacing the church, state or nobility [Source: Miri Frankel, Beanstalk, NY].